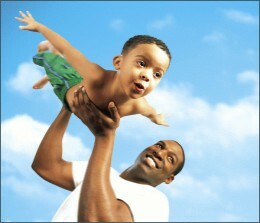 The father of a righteous child has great joy; a man who fathers a wise son rejoices in him/her." Over the past few generations it has almost been shocking that a man was a father to their child; whereas in previous generations it was appalling not to be. Some are forced in to being fathers by a judge or berating family members and the child suffers regardless. However there are still many men who happily choose to be fathers that lead a life of love and excitement. Three of those men are opening up in a panel about the joyful truth of being called Daddy. Michael A. Johnson, 31, is a New Father of 15-month-old Addison and upcoming arrival Sterling. George Cotton, 48, is a Seasoned Father of his three sons Brandon (8), Mark (17), and Quran (20). John Fletcher, 62, is an Empty Nest Father with two daughters Jasmine (35) and Carmen (25) and Grandson Marcus (12). Michael, New : The first time was planned and heavily anticipated. I was overjoyed. Both Monica [wife] and I were very much looking forward to it. I was extremely excited about the opportunity to be a father and be a good one. Having no father growing up shaped much of how I perceive fatherhood. I cherish it very much and want nothing more than to be the best father possible. Our second installment was a surprise to us, so there was more anxiety involved, and uneasiness as the conditions were different. George, Seasoned : I was overjoyed to know I would be bringing a child, a son, into this world to carry on my name. I am the last of my father’s children and the only one to have his last name. Knowing I had a son to continue our legacy bought me great joy, having a child of my own was a tremendous blessing from God. When my second wife were dating and she told me she had two sons – I couldn’t have been more happy to know, in the near future, I would be adding to my family two more sons, two more blessing from God – my family was growing. John, Empty Nest: I have been blessed with two wonderful daughters and was fortunate enough to be in the delivery room to observe their deliveries. In the past, experiences allowed me to observe the miracle of birth, but I was in complete awe, my emotions were at an all-time high when I saw my own progeny entering the world. Michael, New: I feel a strong spiritual connection to both of them [children]. I am a believer in spiritual connections, especially where strong bonds are between people. I’ve heard it said that a woman becomes a mother at conception, but a man becomes a father when he has seen his child. In my case, I couldn’t disagree more. I spoke to Addie in the womb constantly. I prayed over her, speaking great things into her life. I kind of felt like we were getting to know each other and I couldn’t wait to see her and share life with her. I am very much sensitive to her [Monica, wife] emotions and even physical feelings; pain, sickness, etc. Most people would find that strange. Our love has not always been perfect, but it is definitely real and deep. Her creating and carrying a part of me inside her definitely has increased that connection. I believe that relationship has extended to Addison and hopefully it will to Sterling as well. George, Seasoned : I knew when I first met my wife would be together forever. I told her while we were dating, when I get married again there will be no divorce decrees, we will work through whatever comes our way. When I asked her to marry me, I had already conferred with God and He affirmed she was the one I had been waiting for. He told me she was the one He made for me and I was ready to take her as my bride. He instructed me to be a provider and protector, a leader for our children and to teach them how to be great men. I do not make a move with my wife or my children without first consulting God. Once I receive His guidance, I act upon it. John, Empty Nest: Throughout the years, on many occasions while watching my daughters sleeping, playing, reading and especially while talking to them about life lessons I have experienced spiritual connections as well as personal spiritual growth. Michael, New: One word: Patience. I am not the most patient person, but fatherhood has grown my patience leaps and bounds already, without even realizing it. I’ve learned the frivolity of so many things I gave my time and energy to throughout my life. So much has totally dropped off my list of priorities since I became a parent. I’m also really focusing on nurturing the innocence of childhood and the beauty of life while seeing how damaging the world is. Addie wakes up happy every single day. She never wants to sleep in, she's just ready for the world that day. She just wants to play, to laugh, to love on you, and be loved, taste this, touch that, and experience new things. There’s no malice, no evil intent, and no baggage...it's beautiful. I've learned to embrace the beauty of life because of my daughter. George, Seasoned: My oldest son has taught me great compassion, my middle son has taught me wisdom and my youngest son has taught me extreme determination. Each one of my sons is intellectually smart and goal driven; I am a very proud father. John, Empty Nest: PATIENCE, PATIENCE, PATIENCE. Our youngest son is the comedian. He is very smart and tries to set me up to get in trouble with my wife. He made a general store outside of his room and asked me when I was coming by to make a purchase. I told him when mom gets home we will come and pick up a few things. He pushed me to buy some books he had for sale so I did to make him feel good about his new business venture. Well when mom came home, he had somehow retrieved all the items I had previously purchased (with real money and he only accepts the kind that folds not jingles) and had them up for sale again. Except Mommy got a 15% discount rate and I paid full price! He looked at me and said well she is my mom I can’t charge her full price. I could not stop laughing! My most cherished moment with my older daughter was the elation we shared with the birth of my first and only grand. IT'S A BOY! For my younger daughter it was at her graduation from college. A moment immortalized with a picture of us hugging shortly after the ceremony with her in cap and gown. The picture sits in our back den to this day on the top shelf! STRENGTH FROM YOUR RIB IN DIFFICULT SITUATIONS. Michael, New: The most difficult time I’ve had to date is Addison her getting her shots or pretty much anytime at the doctor. She hates it. I had to look away, and separate myself a little bit. It’s like she’s screaming and crying for you to save her because she doesn’t understand. I could feel the sadness and desperation. My answers are making me sound so emotional. Lord, I guess I am when it comes to my baby. My wife has to help me grit and bear moments like that, she has truly been my rock in those situations. George, Seasoned: My wife is very smart and very wise. I love her ability to be rational and calm when dealing with our children. She will always get me to focus on the bigger picture and to understand where our children may have developed an idea or a specific way of thinking causing them to react in a certain manner. While we do not always agree on how to discipline our kids, my wife is very supportive of me and will stand behind me 100%. Our children have never been able to play us against one another because we are a united front and it doesn’t matter who is delivering the message (good or bad) we work as a team and I have her to thank for that. Michael, New: My biological father chose not to be in my life. I had a poor replacement enlist as my stepfather when I was seven. It’s hard to fault to him as I feel he was ill-equipped to be a father at all. He didn’t treat his actual child, my half-sister any better, or my mother, for that matter. If nothing else, my two failed fathers have showed me what not to be. They are my example to not follow. I continue to build a model for myself as a parent and my relationship with my daughter that is the antithesis of what they showed me. George, Seasoned: My father was a strict disciplinary but he was also a very loving, hard-working and compassionate man. He taught me to love my children but make sure my boys grew to be men. Also how to love without terms or conditions but to also give your heart only to someone who is worthy of who you are and all you have to give. John, Empty Nest: Be there for your children throughout. Back them up in public, correct their actions in private. Keep them involved in athletic, civic and social activities while growing up. It's so early in my own voyage into fatherhood, but this is my advice: Never forget to let love be the priority...ALWAYS. My children will always know that I love them first and foremost. Always be a father to your child no matter what circumstances may attempt to keep you away from them. Do not allow anyone or anything to represent who you are. Be present in your kids’ life so they feel and know your love and no one else is speaking for you or about you. Be a man of character. Encompass the values of manhood - courage, integrity, determination. Be noble in your endeavors. Apply these qualities to how you raise your children as well as how you treat their mother and everything will be O.K. Tell us about your Father and how their love has nurtured you.